Index on Censorship brought together a panel of experts at King’s Place in London last night. 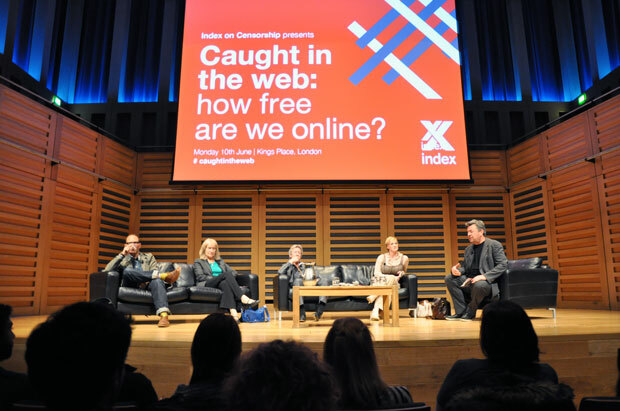 Investigative journalist Heather Brooke, author and digital rights activist Cory Doctorow, media lawyer Paul Tweed, Index CEO Kirsty Hughes and chair David Aaronovitch discussed the threats to freedom of expression online. Brooke, warned that as we increase our online expression, we “create a handy one-stop shop for snooping officials”. She also cautioned that concentrated power in secretive states is a far greater danger to humanity than unbridled free speech. Doctorow, co-founder of the hugely influential Boing Boing blog, said while he was pessimistic about the “Orwellian control” that digital technologies provide governments, he remains optimistic that such technologies can enable us to cooperate, coordinate and collaborate in unprecedented ways to seek positive social change. Doctorow questioned the efficacy of overcollection of data, characterised by PRISM, saying that as an intelligence technique is “like pointing at a pixel with a hotdog”. Belfast-based libel lawyer Tweed said that anonymity online enables speech that constitutes dangerous harassment. He argued that freedom of expression must be protected, but that controls are needed to prevent the undermining of reputation and privacy. He recounted examples from his practice of clients that are harassed and attacked on the web with very little recourse against “internet goliaths”. “There has to be a button to protect the man on the street”, Tweed said. Hughes discussed the emerging geopolitics of digital freedom, noting that while EU countries and the US are lobbying for the preservation of a multistakeholder model of internet governance, Russia, China and others are pushing for top-down government control. Some of the greatest threats to online freedom of expression she discussed are censorship in the form of firewalls and filters, laws criminalising offence, the privatisation of censorship and, of course, surveillance. Aaronovitch fielded questions from audience members who were focused on government surveillance and censorship. Doctorow claimed that web filters are a blunt and inefficient instrument, giving the example of Denmark’s secret child abuse filters, which leaks showed had blocked a huge amount of material that was not related to sexual imagery of children. “Everyone knows web filters don’t work, but once used, removing them would be political suicide,” he said. Brooke acknowledged that current laws are not keeping pace with technology but does not think new laws are the solution. More important is that “our fundamental values be translated into the digital age”, she said. “Nothing to hide, nothing to fear is an arrogant statement”, Brooke commented on UK foreign secretary William Hague’s response to questions on PRISM on Sunday. Hughes elaborated on a statement she made earlier in the day essentially saying that mass surveillance is an invasion of our right to privacy and a direct chill on free speech. Index on Censorship has released a joint statement with English PEN, Privacy International and Open Rights Group condemning the use of national security to justify mass surveillance. Brian Pellot is Director of Global Strategy and Religious Freedom Editor @RNS. Formerly @indexcensorship & @onfreespeech. Cory Doctorow questioned the efficacy of overcollection of data, characterised by PRISM, saying that as an intelligence technique is “like pointing at a pixel with a hotdog”. That may indeed be the case and as an intelligence technique it probably is grossly inefficient but this only adds to the wrongness – it may be inefficient state surveillance but it is nevertheless surveillance – and the bluntness of the technique is likely to throw up a large number of ‘false positives’ as well as missing true ones. So far as government’s are concerned we need to reverse the polarity of ‘nothing to hide, nothing to fear’ and see how they squirm.